William G. Rice, DDS provides quality Athens dentist services to Athens, GA and the surrounding area. Keeping patients healthy is our top priority, so we use the latest technologies to treat a variety of dental issues. Our staff provides quality, friendly service that has earned us a great reputation among our patients. We offer competitive rates, and provide senior discounts. Root canals are a solution to when a root of a tooth becomes infected or damaged. They relieve the pain and discomfort caused by the decay. Though they are often thought of as a painful process, they are often no worse than a standard filling. Dental crowns are teeth shaped caps that cover large fillings or root canals. They come in a variety of materials and can be used to mimic the look and function of your natural teeth. They can also be used to fix cracked or broken teeth. The crowns fully cover the exposed part of the tooth. Restorative dentistry includes all Athens dentist services used to restore your smile. We work with you to create a solution that boosts your confidence. This may include crowns, veneers, dental implants, dental bridges and more. We can also restore teeth that have undergone trauma or extreme decay. Tooth extractions are needed for a variety of reasons. The most common is wisdom teeth removal, which usually requires a small surgical procedure. Other tooth extractions may be due to severe decay or damage that will require the tooth to be replaced. It can be replaced through a dental implant or dental bridges. 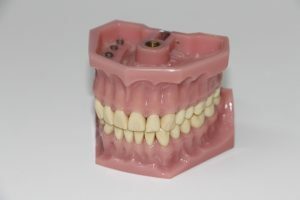 Dentures are another one of our Athens dentist services. They area available in full and partial sets, and they are used to replace missing teeth. They can also be permanent or removable, depending on your needs and preferences. We want to give you back a youthful and natural smile.